There is a nice responsive tabs plugin which is jQuery based aptly called Responsive-Tabs, it handles changing the layout from a tabbed content structure to an accordion layout at a set media query size. The accordion layout is better suited for smaller mobile/tablet sizes. ACF Pro comes with an addon called the Repeater field which allows a user to perpetually add additional rows of data of custom fields to a page or post (or custom post type) in WordPress. This can be an ideal client solution for adding repetitive data without having to enter code or risk user error on inadvertently messing up the html structure of such a tab/accordion layout in the WordPress post editor. This tutorial uses ACF Repeater and Responsive Tabs to produce an easy to use front end solution. Download and install ACF Pro, then create a new custom field group called Tabbed Content with a field label called Tabs (tabs as the field name), this is the repeater field – this will then have 2 sub-fields called tab_link and tab_content. Also in the location area you can target which post/page that you want the Tabbed Content custom fields to appear in. But in this instance I am outputting this as a shortcode, but you can also do it as template, it’s easy for the end user to reposition the content anywhere on the page. The html base structure is simple with an unordered list followed by corresponding divs. In the code I am running 2 while loops as the html has to close the list items before starting the div content elements. 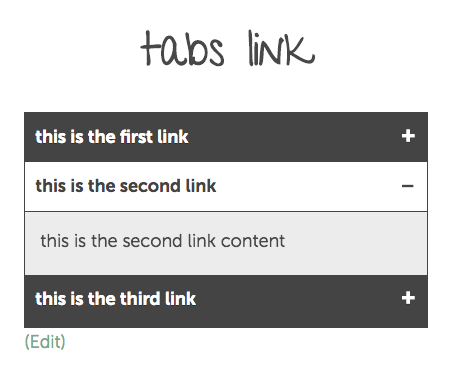 There are 2 increment variables which take care of the href and id linking of the linked tabbed content. For positioning on the page or post you then would just add the shortcode [tab_content] in this instance. Download the Responsive Tabs plugin and extract jquery.responsiveTabs.min.js and file in your /js theme folder also get the CSS files and file in your css folder, the plugin comes with 2 of them, I have put the 2 CSS files together into 1 and slightly adjusted them to remove demo styling and give a more neutral initial style, you will need to customize this further for your design. Also adding some dashicon icons for the open/close symbols. Copy of the CSS is in the snippets. Then also create a jQuery init file tabs-init.js and also save in your js folder. The init file is using the id #responsive-tabs which is the id used in the html structure, use what you like and for more parameters check out the options here. Now enqueue these 2 script files and CSS in your functions.php file and you are ready to add in some responsive tabbed content. CSS for responsive tabs, this has been merged into 1 file, original distribution of the plugin has 2 files. don’t work … i tried many ways ..
thank you very much for your work you saved my life i was tired shortcode ! No worries, glad it worked out! Hi it’s works great thabks alot! how can i add a transition effect between tab to tab? Mine is not reading the CSS. There is a bunch of styles for “r-tabs” and such but when you view the inspector none of those class or ID names are being applied. I take it all back, Firefox was claiming all the assets were being loaded but Chrome corrected them. I think I see my issue. Sorry to bother 😀 Thanks for the tutorial. How do I even get the code on my html page? Do I just type in [tab_content] in my body? Its showing up as text only. The functions is now outputting the tabs from the shortcode for me..
Hi there is this possible to achieve I created a flexible content then I inserted this tabs in repeater however when displaying 2 layouts / repeaters (1 vertical and horizontal tabs). It doesn’t work can you help please on how to achieve two tabs in one page? Thanks in advance! It’s works fine in the backend wp-admin. But I can’t achieve the snippet code to show tabs in the template. I did everything step-by-step, and the fields are showing in the dashboard Homepage, but nothing is showing on my live page. What code do I need to put in my homepage template to make it display?